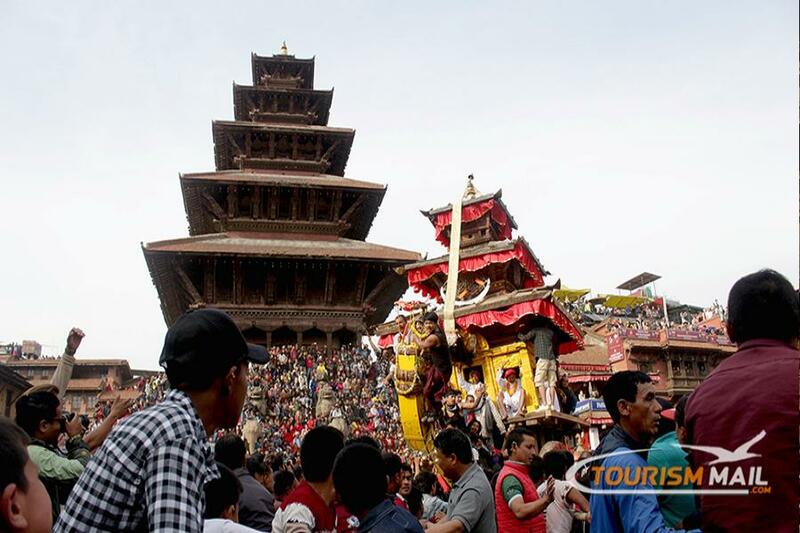 BHAKTAPUR, April 14: A large number of people thronged Bhaktapur today to observe the historic Bisket Jatra (a cultural festival) which is organised each year on the occasion of the Nepali New Year. The festival based on the tantric rituals began today. Prior to this, a lingo (wooden pole) was erected at Bhelukhel yesterday, the last day of the month of Chaita in the lunar calendar and the ceremony drew many people from Bhaktapur and neighbouring districts Kathmandu, Lalitpur and Kavrepalanchowk as well. The traditional belief is that the observance of the Jatra will cause a good harvest, blessing the observer with a divine power to get a victory over enemy. The wooden pole erected yesterday will be brought down this evening, following a grand fair. Meanwhile, devotees thronged the famous Charkhandi Temple here since early morning to observe a religious fair organised on the occasion of the New Year. The mythical belief is that one will be blessed with a good health if a holy bath is performed in a water pond on the temple premises, said a local and culture researcher Ratna Sayami. Likewise, a fair has been organized at the Ganesh Temple at Chitrapur of Dadhikot since morning. Animal sacrifices were made at the Ganesh Temple by the locals of Dadhikot and Sirutar. Another fair was organized in the Gupteshwor Mahadev Temple that lies in the junction of the Sirutar and Tikathali of Lalitpur. Balkot and Sirutar folks have organized a chariot march to mark the Bisket Jatra. The chariot is towed and taken to every thoroughfares with musical procession. Likewise, Mima Chanhesiya ie. Ratriko Jatra (Night Fair) was concluded this morning in Thimi. The fair marked by various processions on the last night of the Nepali month Chait WAS observed throughout the night.